Breathing in Grace: Cold Turkey!!! Do you get a bit excited when you make a life-changing decision?!?!? ....'cause us a bit of anxiety.....but it can also be an exciting time if we know that what we're doing has been orchestrated by our precious Lord and Savior!!! Lately, I've decided to make some changes in my life. I've been on a medication that my doctor put me on close to 2 years ago....and thru a day of fasting and prayer with our SONday school class....actually on my birthday, January 21st....I knew that God wanted me to quit taking it....so....I did...."cold turkey"!!! Prior to that decision, I also cut out ALL soft drinks. Yes....my beloved Diet Mountain Dew is a thing of the past. Last year was a rough year for Pappy and me....to say the least!!! I've gained some of my weight back that I lost in 2010. So....I decided I had to get it under control before I gained it all back. I'm cutting out sweets and lots of other carbs. I find that's the only way I can do things. I know we all approach things in our own way....but, cutting back....slowing down....tapering off....that's just not in my nature....I'm pretty much an "all, or nothing" kind of girl!!! Already....my thinking is clearer....feeling better....getting stronger!!! When decisions like this are made, I like to have scripture to cling to that helps get me thru. I have treasured the words of HIS mouth more than my daily food!!! Have I departed from the commands of HIS lips? Have I longed for HIM more than my daily food? I'm so sorry to have to say...."not always". But, oh how grateful I am that HIS mercies are new each and every morning!!! How 'bout you, Sweet Reader?!?! 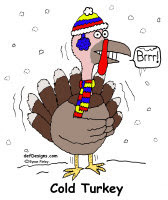 Do you just taper off....or, are you a "cold turkey" kinda gal, too?!?!? So glad to hear this. If we don't have time to be sick, we DO have time to make our diets consume of only healthy foods. I wish the best for you, for health, and your family. You are going to need to be your healhtiest as you are about to need more energy to run around with grandchildren. Cold turkey all the way! Glad to hear you are feeing better already. Enjoyed this post so much. In September I stopped my Mt Dew "cold turkey". I'd tried the taper. Didn't work. I'm a "cold turkey" kind of gal. Thanks for the reminder that I am. I have a few things to work on this year. I think I'll make a list and do them one-by-one "cold turkey".